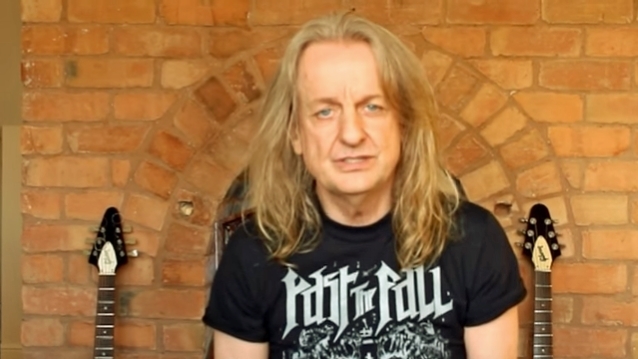 In a brand new interview with The Guardian, former JUDAS PRIEST guitarist Ken "K.K." Downing revealed that he actually sent two resignation letters to his bandmates more than seven years ago when he decided to quit the legendary heavy metal group. The first is described in the article as "a graceful exit note, implying a smooth retirement from music," while the second was "angrier, laying out all of his frustrations with specific parties." Downing told The Guardian that he believes the second letter was "a key reason" he wasn't invited to rejoin PRIEST following Glenn Tipton's decision to retire from the road due to his battle with Parkinson's disease. K.K., who is promoting his newly released autobiography, "Heavy Duty: Days And Nights In Judas Priest", also said the other members of PRIEST have tried to remove him from his ongoing position as a co-director of the PRIEST organization, a role he's unwilling to relinquish. Despite all the bad blood, Downing said he hopes he and the other members can repair their relationship before it's too late. "If something happened to me, I'd like to think the guys would come to my funeral, and vice versa," he said. "You never know what's going to happen." Downing has called Faulkner his "clone" and revealed that he "never found" Tipton "to be particularly easy to get along with. Very early on, I was fully aware of the limited conditions under which he operated," K.K. wrote in his book. "If you were going to relate to him, you would do so entirely on his terms." "Heavy Duty: Days And Nights In Judas Priest" was released on September 18 via Da Capo Press. The book was co-written by the Scottish author and journalist Mark Eglinton, whose previous collaborations include "Official Truth, 101 Proof" with Rex Brown of PANTERA and "Confessions Of A Heretic" with BEHEMOTH's Adam "Nergal" Darski.